Good for you! Glad things are better and I’ll cross my fingers for a future sale of fabric from your “smoke free pet filled” home. Happy for you! I know it’s hard to give up the stash! But you will gain a puppy! I look forward to the auction and the quilts for sale! Congratulations on finding that special new place to live. That is not an easy task especially when you are not feeling your best. I too am already selling some of my things because I need to move for my sanity but can’t yet because I have my canine kid Lucky that was a stray rescue. He showed up 9 years ago and I believe he had been abused. He’s afraid of about everything. And he an American Staffordshire which isn’t welcome in most places. So I wish you the very best I will check out your auction. Love your strength to share what you are going through. Thank you. Will you have a “buy it now” button option? Look at you making lemonade out of lemons! Keep moving forward, good things are already happening. Best of luck with the sale and best wishes today and always. Very happy for your good news Mary! I hope you and Phillip Larkin have a long happy life together! Looking forward to your sale and hearing more about him. Photos too! Glad you found your way around the wall that was stopping you from having your puppy. Instead of going thru the wall or over or under sometimes you just need to find a way around it. Congrats. Wishing you good renters for your condo. I am so happy your doing well. New place is such a great feeling. I know how you feel about parting with your stash. I had to do the same years ago. It feels good to give to others even when you sell your fabric and books. Time is a good thing and all will work out. Keep the faith. I am happy for you and look forward to seeing a picture of your future puppy and hearing all about him/ her. Hope I can figure this out! ( remember, I sewed my square wonky in Racine!?) I have been so sad about Phillip. Glad to see you are moving! Mary, you will be in my prayers as you transition into a new home. His exciting! So grateful that you want to share a little part of you with us. May you be blessed in this new chapter and may your new home be a new start. We are dog lovers too and cannot imagine our lives without dogs. Great that your place allows you to have one. This is a FANTASTIC idea. Forge ahead, great things lay there (lay. lie? lay? I never know)! In any event, a cuddly face-licking puppy is where it’s at!!! and beats a pile of non-face-licking fabric to fill the heart who has longed for him all these years. Congrats Mary, this is awesome! So proud of the progress you are making. Take care of YOU! Good for you! . Congratulations on your new digs – a judgment free zone which you can share with a furry companion. Happy to read this news. And as the owner of a burdensome stash who salivates when she sees a new line – letting go of it sounds so freeing! Oh Mary Fons, you are a joy. I DO have your book and love everything about it. I have every issue of Quilty when you were its creative force. I grieve to learn you’ve suffered major depression lately but am even more fond of you for explaining it so matter of factly as it is so unfortunately common. I thought your narrative was going to end somewhere in Marie Kondo territory, rather than Small Condo territory. But all your number one fans, like me, are excited for your new adventure! Please post some photos somewhere of the before and after of what you do with your new dazzling bachelorette pad! “shadows” in my life. Moving is hard – treat yourself to whatever treats you enjoy (wine, chocolate come to mind). A fresh start is always good – and a puppy! Great thinking. Is this USA only? Yes! Just USA, sweet Janice. The Flat-Rate thing dictates it. But I love you! Understandable…but in my mind I bought one! Mary, I’m so glad you are better. I Would love to have one of your boxes. I know the fabric well be fabulous. Take care. Lv. I can feel the happiness in you writing. You will love your new place! Congratulations to you. I am sew excited about your garage sale. The puppy you are getting is he the one you thought you could have or will you have to wait for another litter? Cheering you on . I reallllllly want one of these boxes, and your book, and your cheeky certificate. I’m not a pre-washer though–is there enough fabric in each box to make an entire quilt? And do they coordinate at all? Not up yet, Shawn! Soon! Yay! Such great news! And more great news on top of great news! Can’t wait to see your fabric, etc., but more importantly, I cannot wait to hear that you’ve gotten your new baby!! Great things ahead, Mary Fons! Soooo glad you’ve found a way to have Phillip in your life! I am ecstatic for you. You needed Philip and the move was a great idea! You’re smart, you’ll be fine. Congratulations! BRAVO! I’m proud of you! You are grabbing hold of the FUTURE and moving forward. This is wonderful all the way around! Mary, this is excellent news – that you have made a major change toward your happiness. I kinda want some of your fabric simply because it was yours. I can say my quilt will contain Mary Fons Fabric. How cool is that? HI MARY…I used to sell some things on Ebay, and I swap fabrics with a cousin that lives on the east coast and I can vouch for you that the box (with the book in there) can hold 14 to 17 yards of fabric! so this is quite a deal. I am so excited for you to be moving to your space. YOUR HOME!!! makes a difference when you leave it and lock the door, as opposed to renting. and a PUP to keep you company….seems pretty darn perfect to me!!!! easiest way to downsize, too! Whoop whoop! This is awesome news in every way! I am clapping my hands together over here for you!!! I totally think you are making the right decision on everything! I have tears of happiness in my eyes for you- seriously ❤️ I want to bid on the fabric and do my part and help you along your way. I am not good with the computer so please lead me/ us by the hand in every step on how to get to the right site and do this! Bravo Mary! Will there be a way to pick which box we would want? Also, can someone who doesn’t use facebook participate? excited for your blessings…..a sweet little doggie! Doesn’t get much better! And the stars align*****Congrats on the Phillip Larkin solution. I’m thrilled that you’re moving to a pet friendly apartment. If you have any fabric to donate, contact a Lutheran denomination church in your area. A lot of them have quilting groups that make quilts for Lutheran World Relief and local hospitals. We love accepting donations. Congratulations! The short term pain will be soooo worth a Philip Larkin! We’re getting ready for a move too, so I know how enormous the effort is, believe me! Best wishes!! Fun! I want some for SURE! Your spirit would certainly inspire a project. This is an unrelated question- I wonder, did it help you to have people offer advice or were you thinking it anyway? I was hoping you would move, but I knew you would figure out what was best for you without my advice. I’m naturally a bosser as a big sister, and have been trying to tone it down over the last couple years for the sake of my friends and family. What kind of advice giving did you find supportive? Doing the happy dance in Memphis!!! A great solution! Hard to part with fabric I know—good for you to do this. I hope all the boxes sell. Love what you are doing, and I’m 99.9% sure they will be SOLD by noon. 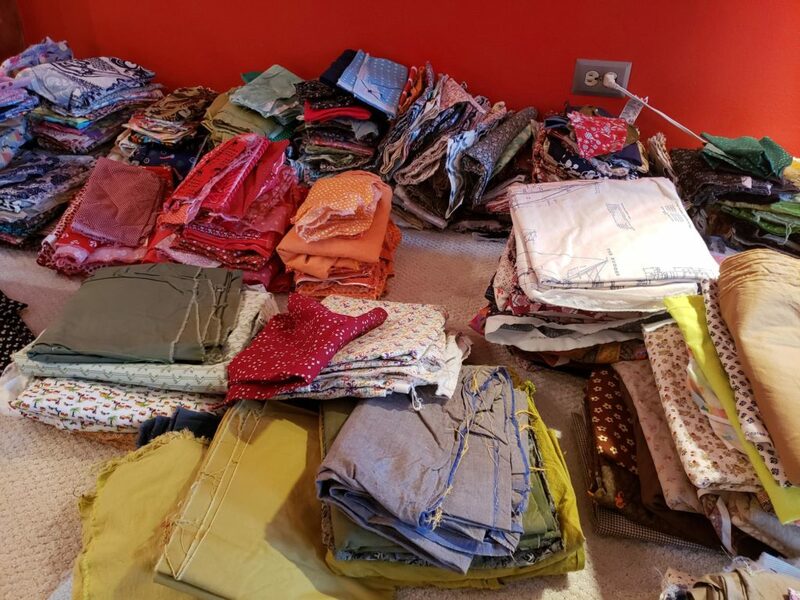 However – IF you have any fabric left, please consider donating it to Living Threads Ministry in Zeeland, Michigan. I volunteer there, making memory quilts which funds Bible classes and meals for over 500 children in the Kibera Slum of Kenya. A double blessing you can give to families here and there. Thank you! Hi Mary! I love this idea! Can’t wait to see what is up for auction, I do want a box!! But…I would also love to see pictures of the new condo! I love to see how others decorate and just live in their spaces!! Good luck with the move!! Rest assured that your fabric is going to good homes. Congratulations on the move! I needed happy news today and you just gave it to me. The news that you are moving to a new pet-friendly apartment makes me warm and fluffy and teary-eyed. Go you! I’m so excited about your move and your progress. I have a huge stash of fabric also, but if it came down to a choice between my two pups or my fabric, I wouldn’t think twice and the fabric would be gone. You are an awesome person and you will make a wonderful, responsible puppy owner. Mary, you’ve always been such a wonderful lady and a quilting friend. Wishing you well for your upcoming move and what a cool idea to part with your stash and share it with others! I have one suggestion for you, look up the book “Before You Get Your Puppy” by Dunbar (can’t remember his first name right now). It is available on line, he has a lot of classes in dog/puppy training. If you start out right everything is so much easier, no retraining. Glad to hear you are feeling better, and I know the puppy will help a lot. I can’t find a link to the auction. Help!! Oh Mary, (me, taking a deep breath) I’m so happy and relieved that things are looking up! I’ll (we’ll) be anxious to hear updates on your new place, and Philip Larkin. I’m so happy for you that ‘things’ are finally going your way and little Pipkins can finally live with his mistress Fons. I have some Larkin literature I’ve been meaning to send you for months – is your p.o.box the same address? Good luck with your move on Monday. I have sold a TON of fabric and I feel zero guilt about it. I dig through estate sales to get some amazing finds, clean it and press it, and keep the stuff I want. The stuff I that doesn’t make my quits sing? Ebay. People who can’t/won’t go find them then have access to amazing midwestern vintage cotton. (I sell a lot of it to places like NY and California.) It’s a great system! Plus it puts money back in the kitty for, you know, groceries. This is a great idea, and I’m bidding! I’m so glad you are getting your puppy, and also – look at you, real estate mogul! I’m so proud. Hugs!